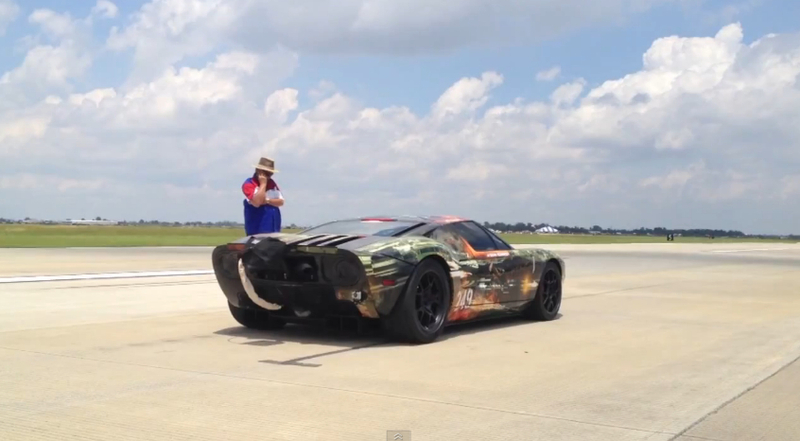 Sean Kennedy, about to drive Mark Heidaker's Ford GT into the record books. The concept is pretty simple: find a straight, wide and under-utilized concrete runway, preferably as long as possible. Invite the fastest cars and bikes you can find to drop the hammer for a set distance, usually a half or full mile, and document the results. That was the recipe for success followed by last weekend’s Houston Half Mile, which builds on the success of similar events such as the Texas mile. At last Saturday’s Houston Half Mile event, Mark Heidaker’s 2,000 horsepower Ford GT (tuned by Hennessey Performance) ran 212.9 mph over the half mile with driver Sean Kennedy behind the wheel. As far as we can tell, that’s a new world record for a production-based car, and it easily beat the half-mile speed of 204 mph set by Kennedy in the same car during this year’s Texas Mile. That means owner Heidaker and driver Kennedy now own both the standing mile and the standing half mile speed records, which is no minor accomplishment given the number of participants. The record speed in the standing mile sits at 257.7 mph, so the new benchmark is 260 mph. If conditions are right, expect the team to break the 260 mph barrier at the next Texas Mile event, coming in late October.